A 100 day artwork, featuring people on Trafalgar Square's Fourth Plinth. Jane's appearance was Sunday 27th September 2009, 10am - 11am. "In the summer of 2009, sculptor Antony Gormley asked the people of the UK to occupy the empty Fourth Plinth in Trafalgar Square in London, for an hour each. A space normally reserved for statues of Kings and Generals, they were to become an image of themselves, and a representation of the whole of humanity. Every hour, 24 hours a day, for 100 days without a break, a different person made the Plinth their own." By an amazing piece of luck, Jane's application to appear was successful, and on Sunday September 27th 10-11am. she was there. 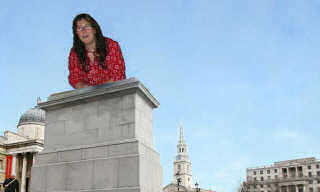 The Fourth Plinth is the name given to the empty plinth in the north-west corner of Trafalgar Square in London. It was originally designed by Sir Charles Barry and built in 1841 to display an equestrian statue. There were not enough funds available at the time to create a statue and so the plinth was sometimes referred to as the 'empty plinth'.